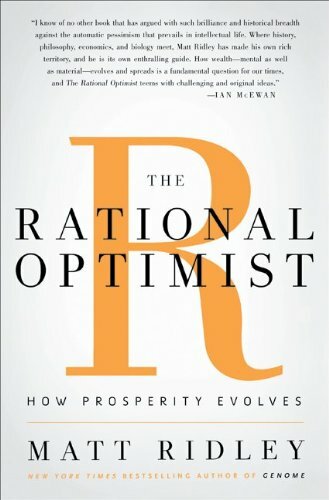 Humans tend to be very optimistic about their individual lives – for instance we buy lottery tickets, but we are fundamentally pessimistic about the future of the world. The sensationalist press plays a crucial role in enhancing our pessimism. Bad news simply sells more, so a conflict in the Middle East or an oil spill will more likely make the headlines than a recent development in medicine. We often seem to forget the extraordinary achievements the human race has made in the last century. In our lifetime, food per capita and life expectancy both increased by one third, while income per capita is up three fold. Child mortality is down two thirds, and global inequality is falling at an unprecedented rate. Moreover, we live in the safest and most peaceful times in history. Torture, for example, used to be a spectators sport in Medieval Europe, but today it is unimaginable in most parts of the world. You most likely heard of the imminent danger of running out of natural resources, forgetting that we live on a green, abundant planet, covered in water. Ridley argues that dramatic technological innovation will help us use our resources more efficiently and sustain ourselves for many generations to come. The recent developments in fracking, solar energy, and water desalinization are only a few examples. You very often read about global problems of all types: the Middle East is unstable, European economies are weak, the US is massively in debt, world trade contracted, and the planet is getting warmer. However, despite these issues, many of which are short-term in nature, we need to remember to look at the big picture. The Rational Optimist reminds us that we are experiencing an incredible burst of development, and that a healthier, kinder, and more prosperous future lies ahead of us.